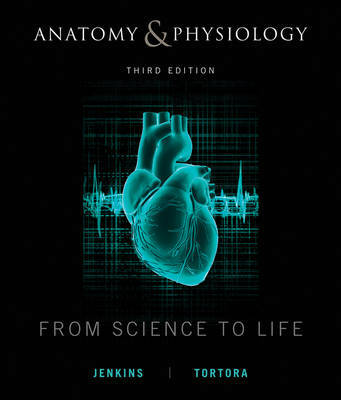 Anatomy and Physiology: From Science to Life, 3rd edition builds on the success of its prior editions by providing solutions to recurring issues. The 3rd edition better motivates students and helps them make the connection to what is important going forward and helps students who lack study and critical thinking skills. The entire text is focused on aiding critical thinking, conceptual understanding, and relevant application of knowledge when studying Anatomy and Physiology. From Science to Life, 3e effectively blends print and media to bring the content to life for students. The conceptual focus allows for fewer pages in the printed text, making the text less intimidating to the uninitiated student. Accompanying media allows for a richer investigation of the content presented in the printed text, provides useful background knowledge, and ensures the students a solid reference resource when the course is complete. WileyPLUS sold separately from text. Jenkins, Gail; Jenkins, Gail; Tortora, Gerard J.; Tortora, Gerard J.